Racine Mayor John Dickert announces his planned resignation Monday. Racine Mayor John Dickert said Monday that he plans to step down later this year, and there is already one candidate looking to replace him. 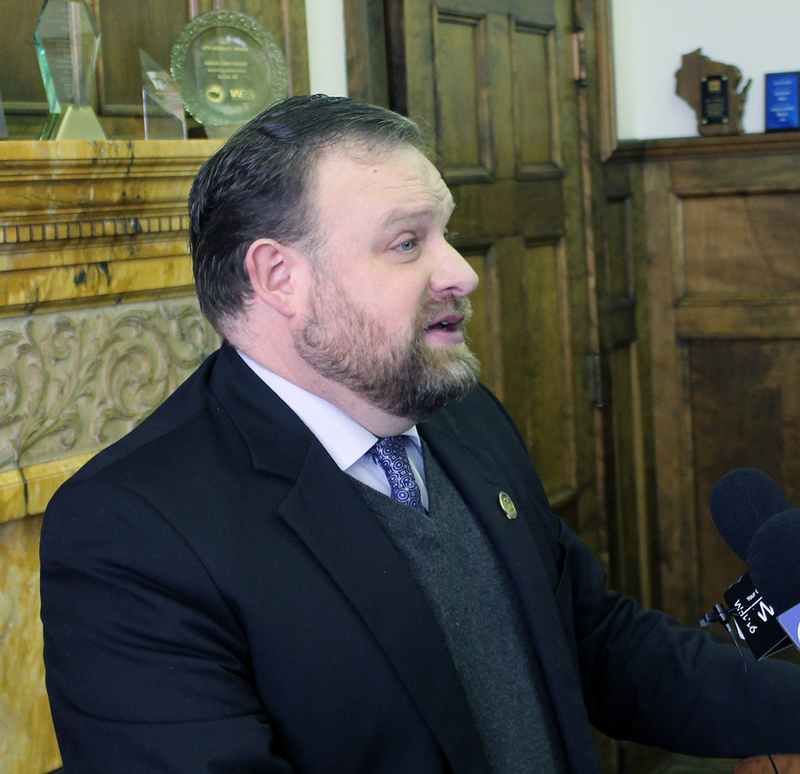 Dickert made the announcement during a joint press conference at his office that also included Democratic state Rep. Cory Mason, who broke the news that he plans to run for the seat. While stopping short of endorsing Mason, Dickert introduced the lawmaker to reporters after revealing he plans to leave the mayor's office this summer to become executive director of the Great Lakes and St. Lawrence Cities Initiative, a water advocacy group. Dickert said he anticipates a special election will be held this fall. Dickert, who's in the middle of his third term, said he was approached by a search committee and hadn't lobbied for the job.The 55 year-old mayor has been passionate about water issues for some time. In addition to sitting on the board of directors of the initiative, Dickert is a member of the state's Coastal Management Commission and the U.S. Conference of Mayor's Water Council. Dickert told reporters the country is headed for big problems if it doesn't get serious about water shortage issues. "Water is the next major political and economic battleground for this country and for our future," Dickert said. "The new administration in Washington has made it clear that we will have significant challenges ahead of us." Dickert said he's particularly concerned about the recent ruling that allowed the city of Waukesha to siphon water from Lake Michigan, potentially opening the door for dozens of other communities near the Great Lakes to follow suit. "We're using water like it's a resource that is always going to be there and always going to be recharged and regenerated," he warned. "The Great Lakes only recharges at 1 percent per year." Mason told reporters that if elected, he would continue to press forward on many of the issues Dickert launched. "I see myself as sort of picking up the torch where this administration has taken the city," Mason said. "The issues remain the same. We have accomplished a great deal but there are challenges that remain." Chief among them is the development of a proposed arena and convention center, and the development of a proposed residential and retail center along the Root River. Mason has represented his district in the Assembly for more than 11 years. Other candidates are expected to enter the race for mayor. "Whenever the seat opens up like this, it tends to attract anyone and everyone who thinks they have the wherewithal to be mayor, said City Administrator Tom Friedl. Friedl himself is leaving. He goes into retirement at the end of the week. A replacement has already been hired.